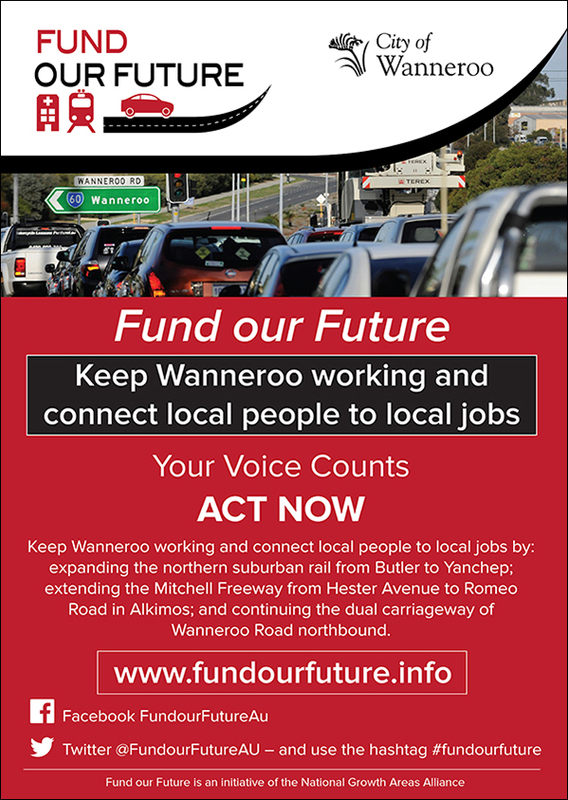 City of Wanneroo decided to participate in this years Fund Our Future in order to gain Federal Funding for those infrastructure projects we need urgently in the City of Wanneroo, including better transport. The City of Wanneroo is one of the fastest growing Local Government Authorities in Australia. They are also asking for volunteers to wear their Fund Our Future uniforms, and hand out bumper stickers/flyers/take signatures on iPads in strategic locations. 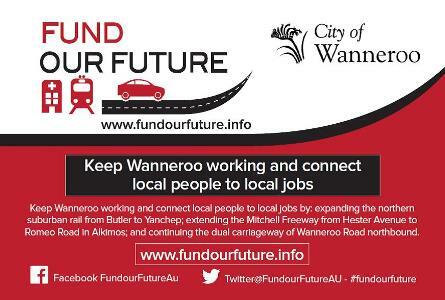 The City of Wanneroo will also have Fund Our Future banners in key locations along Marmion Ave; Wanneroo Road during the day- and have volunteers driving the Fund Our Future branded ute on Marmion Ave; Wanneroo Road; the Mitchell Freeway and Hester Ave in the afternoon. You may have also seen the VMS signage promoting Fund Our Future at the Joondalup Drive/Wanneroo Road intersection. There will be numerous photo and social media promotion opportunities on this day of action. Your participation so far has been much appreciated and they would love it if some local residents would like to take part in this day of action in any way possible. You certainly don’t need to be available for the full day – any time or even suggestions that you could provide would be most appreciated. Further information regarding the approved locations will be provided via regular updates. Please do not hesitate to contact Paige Berdal on 9405 5651 or Janet Takarangi on 9405 5926 if you would like to be involved.